Sean Bresnahan warns that an attempt is being made to rewrite history, with some victims of the conflict being targeted and discriminated against, even in death. 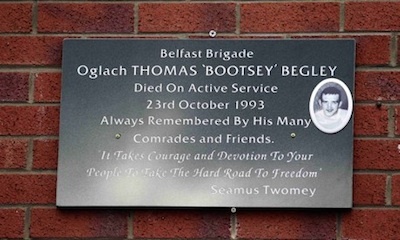 What are we to make of the furore in Unionism surrounding the unveiling of a plaque to Thomas Begley at the weekend in Ardoyne and what can it tell us about the troublesome question that seems to have paralysed the political process in the six-counties - what or who is a victim? Placed against the backdrop of ‘Castlederg’ among other things, such as the need to designate as living in Northern Ireland in order to get on the electoral register, we can determine that much of this is the outworkings of a cultural war designed to revise history and in doing so legitimise the continuing, ongoing British partition and occupation of Ireland. For this to succeed then republicanism has to be labelled as the bad guy, singularly intent on all manner of death and destruction, while the state was merely an upholding agent of the law. The causes of conflict that led to nearly 30 years of violent insurrection against that state and its laws do not come into it and are to be minimised to the greatest extent possible. The IRA are to blame and this is to be the defining narrative, there can be no equivocation between the Provo war and its resulting casualties and that of the state and those who died or received injury at the hands of the state. Thus commemorating dead IRA Volunteers is beyond what’s socially acceptable while paying homage to the mass-murdering British Army each November at the Cenotaph is something to be lauded and held in an elevated esteem and as a source of pride. Those wretched Catholics are still to be shown their place it seems in the supposedly all-new ‘bright and shiny Northern Ireland’. Watching the Nolan show on Wednesday night past I have to admit to feeling the calculated and sweeping bias that continues to infect everything about this place in the way the programme was set up. It wasn’t difficult to sense that the governing rationale behind this so-called ‘debate’ on victimhood is to ensure the criminalisation of the IRA and everything it stood and fought for. For the likes of not only Nigel Dodds and many within his constituency but the British government itself it seems the only true victims were those killed by the dastardly Provisionals; everything else, from Ballymurphy to Bloody Sunday to Malachy Boyle’s and Loughinisland, is secondary in the dubious context that the IRA killed the most people during the conflict; as if that somehow absolves the actions of the state and its paramilitary off-shoots. I don’t seek to detract here from the awful pain no doubt felt by those who suffered as a result of the Shankill bombing, on which the programme focused, but my wife and I wondered where were the survivors of Kennedy Way, where was the in-depth coverage of these horrendous killings? The short synopsis dedicated to the violence inflicted on the totally innocent people of the sleepy Derry village of Greysteel, an attack some hold to have involved the participation of a Special Branch informer, smacked of an afterthought to avoid accusations of political bias. The whole unseemly episode strikes me as indicative of a predetermined agenda to separate the violence of Irish republicans from that of the state and its agents through the construction of a hierarchy of victims. Perhaps even more worrying is that Sinn Fein now appears to have at least partially bought into this logic. The decision to light up Belfast City Hall in the colour of the red Poppy, the traditional emblem to remember not just those in Britain’s armed forces who died in war but also those who served in those wars, including those who participated in the most recent Irish troubles (such as the SAS killers of Peter Cleary, Seamus McElwaine, Tony McBride, Willy Price and many, many others), is surely yet another example of the Sinn Fein leadership bending the knee and hoping for a few crumbs from the master’s table. It seems they are required or obliged to continually demonstrate their suitability for government, in the process further legitimising British actions in Ireland and, importantly in terms of attempts to create a hierarchy of victims and thus a monopoloy on the legitimacy of the use of force, without a corresponding quid pro quo for the actions of Irish republicans - sackcloth and ashes spring to mind. John O’Dowd’s recent admission on the BBC that future republican commemorations would have to be “looked at” in the context of the uproar about Castlederg feeds further into this line of thought, a result no doubt of the Tyrone Volunteers’ Day parade in that town provoking the ire of Unionism. Indeed it was stated as one of the reasons for its reneging on the redevelopment of the Long Kesh prison complex. The reality is that both the British state and political Unionism are intent on exploiting the dependence of Sinn Fein’s current strategy on its need to be in government and its need to demonstrate continuing electoral strength and relevance. They are under no political pressure to provide any equivalence between the IRA’s campaign and that of the British military and its paramilitary extensions and feel more than comfortable in pushing the boundaries further and further, secure in the knowledge that for Sinn Fein to attempt any sort of a walk-out at this stage of the game spells lights out. Because both the Brits and the Unionists are acutely aware that Sinn Fein has lost the confidence of the republican community and now depend on the middle classes to maintain their political position. Any return to the radical street politics of old is simply a non-starter, despite the ‘looking over the shoulder’ we now see in an attempt to claw back the ground ceded to an emerging breed of republicans unwilling to participate any further in this normalisation process. The bluff has been called. It’s expected of Sinn Fein to cede the right of the British side to honour its dead, indeed expectations are that not only should this be tolerated but indeed actively facilitated. Meanwhile those on our side are increasingly referred to as terrorists and criminals in a type of language not heard in many years, though of course it has always been there beneath the surface. It’s just that now they feel safe to openly declare things so without jeopardising the continued participation of republicans in the British political arrangements here. But not everyone is prepared to sit back and allow this counter-revolutionary narrative to embed itself to the point where it is beyond challenge. Hard as it may be for those directly affected to acknowledge, and understandably so, neither Thomas Begley, Sean Kelly or indeed the Provisional IRA itself intended the devastating, horrifying consequences of the Shankill bombing. There will be those that argue there is no excuse and can be no excuse but whether we like it or not we simply can’t divorce this sad event in our history from the context in which it took place - a 25 year terrorist war inflicted on the Irish people by the British state in which men and women had little option but to defend their communities from foreign aggression and attack. Yes to an extent by the end of this terrible period in our history much of the violence may have degenerated into a series of horrifying incidents one after the other but that was certainly not the fault of the IRA alone as they would have us believe. Indeed when it comes to determining who was at fault for this the Provisionals are at the lower end of the spectrum, ultimate blame lies with those who created and sustained the conditions in which such barbarism flourished - the British state and its occupation of the North. Had these conditions not been there in the first place young men like Thomas Begley would not have felt the need to join a paramilitary army and to undertake the actions that they did. This is the narrative that needs to be rubbed out as the battle over who gets to write history is waged relentlessly by those on the British side, with incidents such as the one in question to be manipulated and exploited to maximum effect in pursuit of this agenda. The most recent offering of the Nolan Show is no exception to this process. At the finish of the thing it seems that both the British and Unionism are more determined now than ever to use the advantageous strategic position they have been gifted by the weakness of Sinn Fein and the inadequacies of its political strategy to attain in times of peace what they could never have achieved during the war - the criminalisation of the indigenous resistance to Britain’s Irish policy. Having secured for the Northern Ireland state a much greater degree of legitimacy than would likely have been thought possible, by convincing republicans to accept and normalise with the governing political institutions and arrangements here, bound as they are within the framework of the British sovereign claim once opposed by the armed struggle of the Provisional IRA, all this has been made possible. The current efforts to elevate victims of IRA actions to a morally superior plateau than those who died at the hands of the British state and its proxies are part and parcel of this renewed criminalisation offensive. For Britain the war is not over and will not be so until republicans, even if they do so only tacitly, acknowledge their total defeat and subservience to the enemy. Achieving a disparity in legitimacy between British state violence, which is to be seen as morally upright, and that of those who resisted the British occupation, which is to be seen as morally reprehensible, is the tool through which they hope to achieve this long sought-after goal, in the process legitimising not only British state terror but British rule and the British occupation itself. They will not succeed.